Day two of the New Year giveaway bonanza… and this is a bit of a body-beautifying treat. I’ve said before many a time that I’m a big fan of epilating, despite the pain – it’s more effective than waxing (if you have fine leg hair), but longer lasting than shaving. And it’s nowhere near as painful as it sounds (essentially lots of little tweezers plucking hairs out on a rotating head…). SO, as I realised I had ended up with two of these in my possession, I wanted to share the love and pass one on to you lovely folk… just read on and get entering below! My New Years resolution is to not be afraid to remove the people from my life who are damaging. It’s an important lesson from 2013. I’m aiming to work out a bit more and eat as healthily as possible to balance out the stress of my final year of my degree! I’m going to try and read more this year and try and live more in the moment. My New Years resolution is to have a more positive outlook on life and attempt to be a glass half fullsort of a person! … to try and be kind to everyone – whether or not it’s reciprocated! I want to be more focused at work this year. My resolution for 2014 is to travel to Britain! Praying hard this will happen. any reason my comment is not been posted? My resolution is to stop procrastinating! I have a busy year ahead of me and need to be able to get things done on time..
My New Year’s Resolution is to try and be tidier(!) and learn to apply more make up – I usually just wear mascara, lip gloss and foundation. My New Years resolution is to be organised! No more being late for me :). To change my career and find a more rewarding job! To stick to slimming world and continue losing weight. mine is to cherish every moment of life because its too short. My resolution is to do things instead of just thinking about doing them. my resolution, the same as last years and the year before that, is to worry less, and yes, I have broken it already! Mine is to lose weight and start paying a bit more attention to myself! My New Year’s resolution is to try not to worry about small things which really don’t matter. Mine is to get back into my regular gym regimen and work harder at work! My New Year’s resolution is to sleep more. I’m spending money on skin care and I forget that sleep is one of the best beauty treatments! I resolve to be more organised … fingers crossed! To get my house in order – the upstairs needs decorating badly! i’m going to drink more water in 2014! 🙂 better skin, better health, good for weight loss! Can you believe I’ve never used an epilator? Maybe that should be my resolution for 2014! My New Year’s resolution is to stop over-committing myself so much. my resolution is to live day by day, without worrying so much about the future! to make the most of my talent instead of being such a chicken! My New Years resolution is to cut down on the number of takeaways I eat and cook more from scratch. 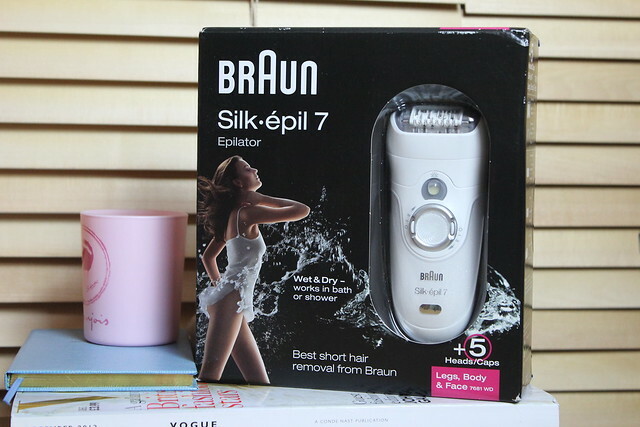 this is such a great giveaway, I’ve been wanting to try epilation for so long but I’m slightly put off by how painful people say it is, regardless of that id still love to win an try this! Another one of my new years resolution is to wear less make up and leave my hair natural more often. Another is to brush my teeth twice a day! I followed on Bloglovin, Nora M.
I also followed on twitter, my twitter is @anna_ishere. I will try to avoid junk food. Hi , great giveaway indeed. My beauty resolution is to take more care of my hair. My new year resolution is to care of my friends and family more! My resolution is to be more confident and happier. This is really cool! Anyway, new year new spirit: I want to become organized as I have never been! Dress-up more, and review new products! My new years resolution is to try and save some money ..boring but very much needed! To Get a Job! Thanks for the giveaway!!! My resolution this year is find the time (in the evening) to take a course and study something i really love. Not because it’s good for my career and not because i need to do it, just because i want to. I’m thinking maybe something about lifestyle and beauty 🙂 Really excited about it too! To stick to a low GI diet for health reasons.